Learn how to master the art of macaron baking. In our macaron masterclass you will start by watching how to make a succesful batch of macaron batter, then you will make your own, bake them, fill them with a selection of buttercream and ganache which will be supplied and look at different ways to decorate them. You will also have the opportunity to ask questions, learn tips and techniques and take lots of macarons home! The classes are taught by experienced macaron masters Marie and Emma who have been running baking classes for years. Our classes take place in our kitchen and have a maximum of 12 learners at a time so it gives the opportunity to be very hands on in a fun and relaxed atmosphere. 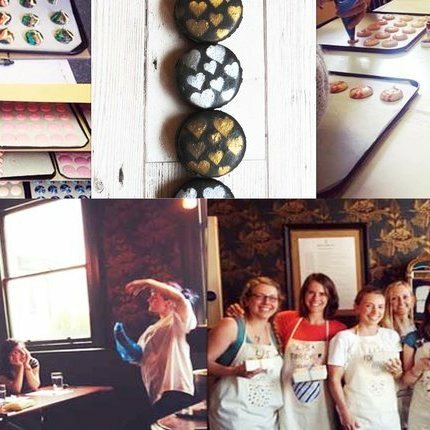 Our classes are suitable for both novice and experienced bakers alike. Nothing! 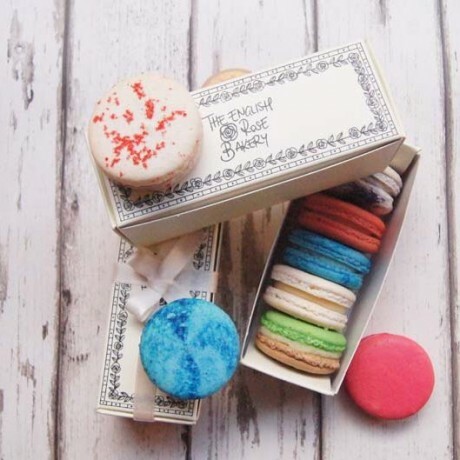 everything wil be provided including aprons, ingredients, equipment and even pretty boxes to take your macarons home with you. This class is suitable from age 16, or from aged 8 if accompanied by an adult. Our teaching room is based upstairs and unfortunately does not have disabled access. Maximum of 12 participants per class. In the event of cancellation of a course by The English Rose Bakery the voucher holder would be transferred to another suitable class. The English Rose Bakery, 66 Oldham Street, MANCHESTER, M4 1LE. This is a 10 minute walk from Manchester Piccadilly train station. There are plenty of car parks in close proximity to our kitchen. Our classes run on Saturdays starting at midday and last roughly 3 hours. Add this listing to your basket. Choose between an electronic voucher or a paper voucher, just enter the receiver’s email address or if you choose a paper voucher, supply the shipping address at checkout. With the voucher you will receive instructions on how to redeem your voucher. Bookings are made subject to availability; for best availability, we advise booking withtin 28 days of the (purchase) order being accepted. If you wish to reschedule your booking, the seller requires at least 14 days' notice. The seller reserves the right to reschedule dates or alter venues due to unforseen circumstances (eg teacher illness), or if fewer than the minimum required number of places are booked for an individual session.